After a long battle between campaigners, consumer organisations, and the Scottish legal profession to get access to legal services opened up, the Which? super complaint seems to have done the trick with the OFT announcing today it was recommending the lifting of restrictions on the legal services market in Scotland, where for some time, anyone wishing or needing access to legal services or the courts has been forced to use a lawyer or advocate ... but if that lawyer or advocate, or their professional colleagues didn't want you obtaining legal services, or getting to court, that was it. All eyes turn now to our Justice Secretary Kenny MacAskill who wrote in Monday's Scotsman of his slight reluctance to give Scottish consumers the full benefits if the Clementi reforms which are enjoyed in England & Wales .. for reasons many seem to suspect are more protective of the legal profession rather than the public interest. Shouldn't we be doing away with this culture of injustice which has been generated by appallingly blatant interference from the legal profession in public life as this problem over access to justice ? 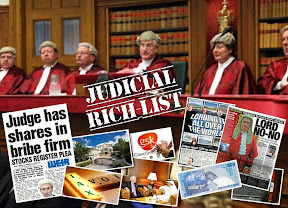 where for 17 years, the Law Society of Scotland, along with allies from the judiciary and willing politicians have kept Sections 25-29 of the Law Reform (Misc Provisions) Act (Scotland) 1990 off the books, simply to maintain their money making business monopoly and restrict everyone's right to access legal services ? 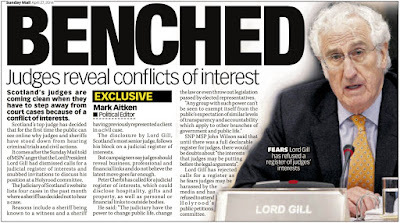 Maybe the Justice Secretary should also be looking to extend the powers of the new Scottish Legal Complaints Commission and remove all regulatory functions from the Law Society of Scotland & Faculty of Advocates because both self regulators have proved they don't have any impartiality at all, and got used to pursuing an agenda of anti client bias which will never change. The OFT has today made recommendations to the Scottish Executive and the legal professions in Scotland to lift restrictions which could be causing harm to consumers. In Scotland there are restrictions on advocates' business structures, solicitors and advocates providing services jointly, third party entry into the market, and direct consumer access to advocates. The decision to recommend lifting these restrictions follows a super-complaint from Which? that called for these restrictions to be removed. Download full response to the super-complaint HERE (pdf 139 kb). Which? argued that the current restrictions against such practices prevent legal services providers in Scotland from adapting their business to best fit the needs of Scottish consumers. The OFT concluded that the restrictions are unnecessary and believes that there would be benefits to consumers if they were lifted – such as efficiency gains and higher levels of innovation in the provision of legal services. The OFT is now looking to the Scottish Executive to outline its approach to removing these restrictions in Scotland, and the Scottish Executive has agreed to respond formally to these recommendations within 90 days. 2. On 8 May 2007 Which? submitted a super-complaint to the OFT about credit card interest calculation methods. See Which? website for details. Section 11(2) of the Act requires the OFT, within 90 days of receiving a super-complaint, to publish a reasoned response saying what action, if any, it proposes to take. A RADICAL overhaul of Scotland's legal system to give consumers greater choice and a cheaper service will be recommended today by the UK's competition watchdog. The Scotsman has learned the Office of Fair Trading (OFT) wants to lift restrictions on the way lawyers operate in Scotland, opening up the profession to competition for the first time. That would pave the way for high-street banks and even big supermarket chains such as Asda and Tesco to enter the market. The Scottish Executive has agreed to respond to the OFT within three months and ministers are expected to accept the recommendations and deregulate the legal profession, bringing in full competition. If that happens, it will revolutionise the way law services are provided and dismantle the closed arrangements between solicitors and advocates that have existed for centuries. The OFT move was prompted by a "supercomplaint" filed by the consumer group Which? It argued that the strict controls on how legal professionals in Scotland were allowed to practice hindered market innovation, restricted consumer choice and might have led to higher prices. At present, solicitors are not allowed to go into partnerships with non-solicitors, constraining companies from other fields from offering legal services and stopping solicitors from setting up joint groups with accountants or surveyors - groups that Which? believes could offer cheaper services to consumers. Also, solicitors are the only people allowed to instruct advocates, a restriction that the OFT believes simply adds another layer of bureaucracy and cost to the process. The OFT will recommend today that all these restrictions are swept away and the watchdog has made it clear it wants early and definitive progress from the Executive. Kyla Brand, the OFT's representative in Scotland, said last night: "We are asking that there should be clear progress on this. There should be some policy statement by the end of the year." She confirmed that, if the OFT's recommendations were implemented in full, it could mean the complete deregulation of the profession and the introduction of new players, such as supermarkets or banks. But she stressed that would depend on the way ministers and the legal profession decided to implement the changes. The OFT did not take a definitive view on the call for an independent regulation body for the profession, taking control of solicitors away from the Law Society of Scotland. Ms Brand said this should only be decided once the Executive and the legal profession had decided to proceed on the lifting of regulations. Kenny MacAskill, the justice secretary, is on holiday and was unavailable for comment last night. But yesterday, he wrote an article for The Scotsman making it clear he expected to drive through change in the legal profession and that the status quo was no longer an option. The legal services profession in England is already some way down the road to deregulation, and there have been fears that Scotland could be left behind if it was not able to compete on a "level playing field". Julia Clarke, from Which?, was delighted with the OFT's decision. She said: "They have confirmed our view that the current system of regulation is failing consumers. We now hope the restrictions will be lifted." A spokesman for the Faculty of Advocates, which had given a cold reception to the Which? supercomplaint, would only say: "The faculty cannot comment upon a rumour." 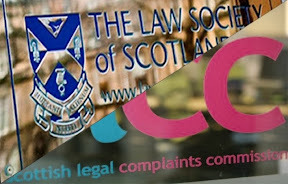 Michael Clancy, of the Law Society of Scotland, which had called for no action by the OFT, said: "The supercomplaint was an important document and the society made its views known about the content of it." Why was a complaint made? Which?, the UK's largest consumer body, submitted a "supercomplaint", as defined in the 2002 Enterprise Act, to the Office of Fair Trading. Which? asked the OFT to recommend removal of current restrictions within the legal services sector, including those on non-legal ownership of firms - allowing outside companies to own and run law firms - and access to advocates, which generally has to be through a solicitor. The argument was that existing business structures and working practices restricted consumer choice and could inflate prices. Did Which? want to see anything else done? Yes. It has a vision of an independent Scottish Legal Services Board to watch over regulation of solicitors and advocates or to take regulation completely out of the hands of the Law Society of Scotland and the Faculty of Advocates. Was Scotland being singled out for reform? No. England and Wales have led the way in many of the areas under consideration and legislation is currently going through the Westminster parliament to apply south of the Border. 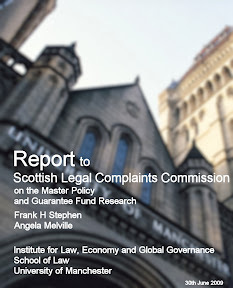 What did the Law Society of Scotland make of the supercomplaint? The society called for no action by the OFT, while recognising that some larger law firms in Scotland supported the introduction of alternative business structures as a way of trying to ensure a level playing field with English counterparts. How strongly did the society make its feelings known about the supercomplaint? 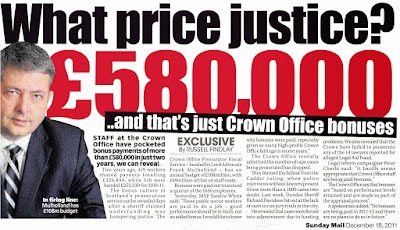 Its chief executive, Douglas Mill, stated: "It is disappointing Which? has produced a document which has no evidential base and which does not contribute in a meaningful way to the debate on the legal services market in Scotland." Was the Faculty of Advocates more tempered? Not really. 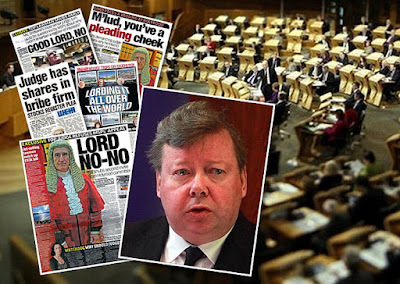 It warned of access to justice coming under "serious threat" and the dean, Roy Martin, QC, said: "It is not appropriate simply to translate arrangements passing through parliament in Westminster directly into Scotland. 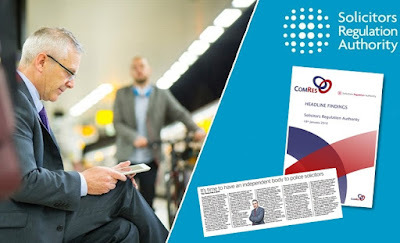 It may be said that the purpose of the supercomplaint is no more than to try to create a uniform regulatory regime throughout the UK for no reason other than regulatory consistency." Kenny MacAskill is proud of the legal profession in which he formerly practised, just as many lawyers are proud of their work. Only natural I suppose, but not a view shared by many people in Scotland who are forced to complain against their lawyer on everything from fraud to embezzlement to falsely inflated bills, to theft, even to criminal activity. Mr MacAskill has said that before, in the Journal of the Law Society, where he also described anyone who took issue with the profession's idyllic ivory tower view of itself as "malcontents"
I wouldn't be happy calling a family "malcontents" who had to fight the Law Society to complain about the way a lawyer stole their mother's money and played for time while she suffered & eventually died of Multiple Sclerosis, citing to the Law Society Complaints Committee that "since [his] client was dead, the complaint should proceed no further" and "the family had no further right of redress" - along with a twisted jibe his deceased client "wasn't very clued up on things on how to deal with life" and "it didn't merit ruining [his] long legal career over someone couldn't articulate their complaint properly". Does that generate any pride in the legal profession ... anyone ? 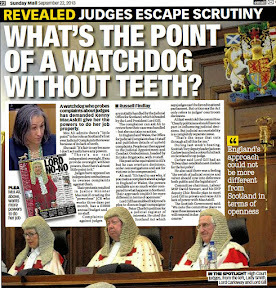 Makes the blood boil, doesn't it .. good, let it boil then ... let people see the Scottish legal profession in it's true light - covering up at all costs and to any end, the crooked activities of it's members when people take issue with it's members conduct. I don't think I would be too proud of a profession, which has struck out to victimise, maim, ruin lives and even send round murderers to it's critics - even to some of it's own people, to maintain it's preeminent position of power & influence, and maintain an immunity from the laws of the land - which have been twisted beyond belief by the legal profession. Today, Kenny MacAskill writes in the Scotsman on the issue of changes in the Scottish legal profession and how the SNP Executive "will not be pushed into blindly following an English approach" ... based on arguments that "our cities and towns is in stark contrast to the huge metropolitan areas down south." What has the size of the client base got to do with things when quality of service, honesty of service, and transparency of service are the real questions ? There are almost the same ratio of solicitors to people in Scotland as there are in England - and by the looks of things, the same ratio of complaints too, so why oh why do the legal profession, and apparently, our Justice Secretary, fear the implementation of wider public access to legal services ? 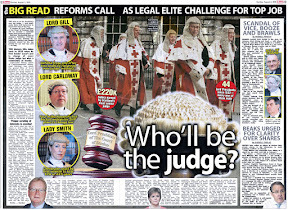 Would it be by any chance that opening up wider public access to legal services - by means of getting to court in a way other than being forced to use a lawyer or advocate from the Law Society of Scotland, may cause ruptures in our creaky antiquated legal system, where control and restriction of who is able to actually get legal representation or access to courts has been the order of the day for so many decades ? Fear .. fear of losing control of the legal system and fear of the damage which would be done, where an individual with a critical case against either the legal system itself or a government institution would be able to secure the very legal services currently denied to them under the present regime of 'the lawyers are in charge of who get's to court because they know best' is what seems to be driving the legal profession in Scotland against change and allowing anyone the right of access to justice. It's called protecting a money making monopoly by restricting access to justice to maintain power and control over people's rights. As simple as that, Mr Justice Secretary. As simple as that, Mr Douglas Milll & Mr Philip Yelland. You at the Law Society know it very well - that's what pays your salaries and makes you wealthy, on the backs & lives of those you ruin. I wonder if Mr MacAskill is trying to turn the argument into a 'sod off England, we won't take your orders' thing - a little something a media adviser from the Law Society ran past a journalist friend of mine last week ... because if so, it won't work. Indeed, only a few weeks ago, I asked John Swinney's Department to have a look at regulation of accountants in Scotland, and you know what happened ? The DTI sent a letter ordering them, the beloved independent SNP Scottish Executive not to respond to me and not to look into the regulation of accountants - this after ICAS intervened and ordered nothing be done on my request. So who doesn't take orders from English authorities now ? .... not so easy to deny that one, is it .... and hardly usable as an argument to generate public support against legal reforms which are actually working out quite well in England & Wales. The following article by Kenny MacAskill appears to be one written for the legal profession - not really for the interests of consumers, and I'm sure the Law Society is proud of that stance, otherwise I assume the article wouldn't have appeared in the Scotsman today alongside Lord McCluskey's diatribe against criticism of how the judiciary & legal profession manage their affairs (which I will cover later in the week). 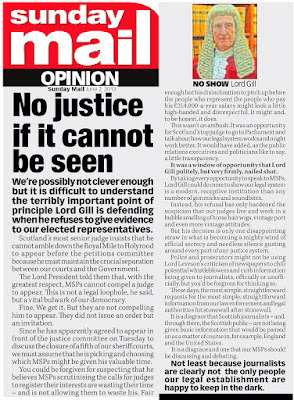 Indeed, Mr MacAskill's article seems so similar to the legal profession's point of view against Clementi which appeared some time back in the Herald, I'm left wondering if the profession is speaking for the Justice Secretary today instead. Does that mean the behind-the-scenes habitual threats, dirty tricks & arm twisting from the leading lights of the justice system is once again overtaking the rights of the public ? Does that mean it's not time to end injustice in Scotland ? Independence for some, but not for others ? transparency, honesty & accountability for some, but not others ? The Scottish version of "Animal Farm" on the way perhaps ? I'm not trying to be too critical, Mr MacAskill - I'm speaking from experience in dealing with a crooked system which has denied me, and many others access to justice, as you and your colleagues know very well. How about feeling pride in the long suffering Scottish public for a change, and give the people preference over the professions ? The right of access to justice & legal services to the public over the monopoly of lawyers to do as they please and dictate who gets justice denied ? AS A former lawyer, I am very proud of the profession in which I once practiced. It has already changed and must change further to continue to provide an excellent service to consumers and businesses. In a global world, Scottish businesses, including the legal profession, should be able to compete out with their borders as well as within. Some already do so and more should be able to do so. There is no reason why Scotland's legal services should not aspire to emulate other Scottish businesses, such as accountancy and finance, which provide an excellent service at home and abroad. To do so they need to be able to compete not just among themselves but with others. The Irish provide such opportunities through mediation and other legal services. We can and should do likewise. The OFT is shortly to publish its response to the super-complaint by Which?. Which? argues for the wholesale opening up of the legal market, along the lines of reform being taken forward in England. This will allow new business structures to form, bringing together lawyers and other professionals, ending the restrictions on clients having direct access to advocates, and creating an independent regulation body. I look forward to seeing the OFT's response and will consider carefully what it says. However, we will not be pushed into blindly following an English approach. Scotland's legal market is different. The size of our cities and towns is in stark contrast to the huge metropolitan areas down south. Such a situation requires a different approach. There needs to be change in the structure of the profession to allow those who wish to compete internationally to do so, while at the same time protecting those who simply wish to continue to provide excellent service. For instance, the legal professions could modify existing practice rules to allow more competition. Alternative business structures could be explored to enable larger Scottish firms to compete internationally while protecting smaller firms. These measures could be implemented without the need for legislation. I recognise some Scottish law firms are already concerned changes in England may put them at a competitive disadvantage - this cannot and will not be allowed to happen. Scottish legal services must be able to continue to compete to win business in Scotland and elsewhere. I want the legal profession to help us design distinctively Scottish solutions. I have doubts about the approach taken in recent years of driving change through setting up publicly run legal practices. My initial view is to support innovation from within the professions to address under-provision of legal services in areas such as domestic abuse, and ensure there is real competition across legal markets. This will be supported by our commitment to putting legal aid on a much more stable footing. I am prepared to consider circumstances where extra funding may be needed to ensure proper access to justice, although we must recognise that increased spending alone cannot be the solution to improving access to justice. Like most politicians I have heard voices from within the profession urging us to let the professionals who know most about their business get on with it. Well, here is an opportunity for the profession to turn rhetoric into action. I have met with both the Law Society of Scotland and the Faculty of Advocates to discuss the future structure of the profession. The Law Society is developing proposals on alternative business structures for consideration at its conference in September and I look forward to seeing the proposals. The Faculty of Advocates has agreed to consider what changes could be made to their practices. While I appreciate the complexities involved in this, I have stressed to both the Faculty and Society that I expect them to come forward with their proposals for change as a matter of urgency. The report by the Research Working Group into legal services can also help inform this work and I look forward to working with the legal profession and consumer interests on this next stage in the development of the profession. The Scottish legal system is a fundamental part of our national identity. I am committed to ensuring that, no matter what changes it undergoes, it remains independent of government and is able to compete in both a national and global market. The process of bringing the Scottish Legal Complaints Commission into existence has taken another step in the right direction with the announcement by Justice Secretary Kenny MacKaskill that it is to be situated in Edinburgh. 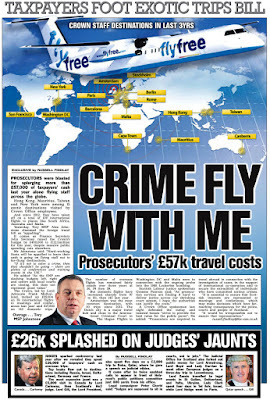 No big surprises there for anyone, as Edinburgh is probably the best home for it, given the propensity of legal firms in the capital to be among the worst violators of clients rights over the years, all neatly kept under wraps by the present regulator of the legal profession - the Law Society of Scotland. Taken together, all those open letters from ex judges hopping back & forth between London & Edinburgh, threats of Court Action from bitter leaders of the Law Society, and strike threats from the solicitor membership carefully engineered by the Law Society itself, must be a powerful set of persuasive tactics to do otherwise .. but for now it does seem the SNP are pressing ahead with something no doubt a few of it's members don't particularly like. The new Scottish Legal Complaints Commission might have half a chance at being independent, accountable & transparent (three things the present self regulators of the Scottish legal profession could never claim to be) it these values were adhered to .. but with the legal profession and their allies going out of their way to make life difficult for the public & politicians alike on this issue, when will the core problems of the legal profession actually be tackled to stamp out the causes of these high levels of complaints ? 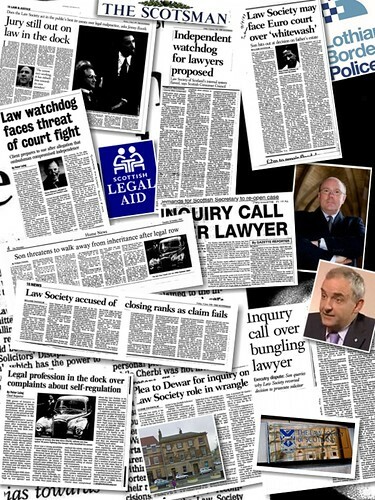 Surely, with the Law Society having been in denial for the past two decades on the quality of legal services in Scotland, consistently putting forward an argument it was effectively regulating the profession & maintaining standards to the highest degree- when it was not, there must be wholesale change within the Law Society of Scotland and the membership to bring new policies of marinating standards and treating clients with respect. Over to you, solicitors of Scotland to take your own colleagues aside and improve your public standing & standards of practice. Stop being led by the nose of people who have led you into one disaster after another and stop blaming clients & campaigners for the woes you yourselves have created. If, as solicitors, you want a greater standing & respect resolve the well known problems which have existed for too long in your own ranks rather than hounding to death members of the public who point out and rightly challenge the wrongs of the legal profession. Article follows from the Herald newspaper. The move of civil service jobs out of Edinburgh is being challenged under the new Nationalist administration, with 60 new posts being located in the capital by the Justice Minister. Kenny MacAskill yesterday said the new Scottish Legal Complaints Commission (SLCC) will be in Edinburgh, where he is an MSP, and that the Scottish Executive is keen to see such scrutiny bodies get together in one centre so that they can cut duplication and costs. Officials are looking for office space, or a campus, where other watchdog bodies could join it, such as the public services ombudsman. The relocation of civil service jobs out of Edinburgh has been highly controversial, particularly with the shift to Inverness for the headquarters of Scottish Natural Heritage. 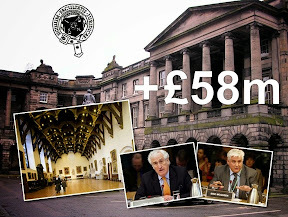 The previous administration wanted to continue the move, so that other parts of the country benefited from government spending on jobs, with a presumption that new agencies would not be in Edinburgh. Former First Minister Jack McConnell even said it was good for Edinburgh that it should lose these jobs. But he faced growing criticism from Edinburgh MSPs, including his own party's, that jobs were not being widely dispersed and that most were going to Glasgow. The largest planned relocation, of more than 1000 civil servants in the Registers of Scotland, was put on hold. An executive spokeswoman said yesterday: "We are currently considering the future direction of the policy on public sector jobs location." The SLCC office, intended to operate independently of the legal profession on some categories of complaints, will be operating by late next year. With up to 60 staff, it is aimed at ensuring complaints against the profession are resolved quickly and effectively. Mr MacAskill, the Edinburgh East and Musselburgh MSP, was one of those who was critical of the policy while in opposition, and yesterday placed the SLCC in the capital city, arguing that is the centre of Scotland's legal community. The decision was "finely balanced", according to Mr MacAskill. "After detailed consideration, a number of factors tipped the balance in favour of siting the commission in Edinburgh. Scotland's capital city is widely recognised as Scotland's legal centre. "This decision therefore places independent complaints handling at the heart of the civil and criminal justice system and close to the hub of the legal profession. "Taken together with the government's desire that the SLCC should share accommodation with other scrutiny bodies in the future, it is clear that Edinburgh is the preferred and right location for this body." The SLCC is to be funded by a levy on lawyers, and a further charge to those who are complained against. and the Press Release from the Scottish Executive on the SLCC ... does anyone get the feeling this new independent complaints body might not be all that we hoped for ? 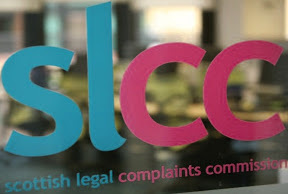 Edinburgh has been chosen as the base for the new Scottish Legal Complaints Commission (SLCC) which is due to be up and running in late 2008. The SLCC, which will be independent of the legal profession, will have up to 60 staff and a remit to ensure that any complaints against the profession are resolved quickly and effectively. "The decision of where to site the Scottish Legal Complaints Commission was finely balanced. However, after detailed consideration, a number of factors tipped the balance in favour of siting the Commission in Edinburgh. "Scotland's capital city is widely recognised as Scotland's legal centre. This decision therefore places independent complaints handling at the heart of the civil and criminal justice system and close to the hub of the legal profession. 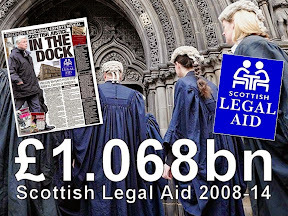 The SLCC was established by the Legal Profession and Legal Aid (Scotland) Act 2007. The Act gained Royal Assent on 19 January 2007 and it is anticipated that the SLCC will become operational in late 2008. Having selected Edinburgh as the location for the SLCC, the next step will be to identify suitable premises that meet the SLCC's needs in terms of space requirements and organisational efficiency. In conducting this search, other factors will also be considered such as shared services potential with other organisations and future co-location opportunities on a campus basis. Scots Law Chiefs turn hostile on consumer organisation in propaganda war against deregulation of legal services markets. The Scottish legal profession's propaganda war against deregulating the Scottish legal services market heated up today with salvoes fired from both the Law Society of Scotland and the Faculty of Advocates against the Which "super complaint" to the OFT calling for an inquiry in to access to legal services in Scotland. The legal profession are of course, unhappy that 'Which" have made a complaint to the OFT on the closed market of legal services in Scotland, where members of the public must use the services of a solicitor for legal services. Predictably, the Law Society of Scotland and it's allies mounted a quick publicity war against any thought the public may harbour over wishing wider access to legal services in Scotland by means of other than using solicitors ... and we have seen many articles since, written by both sides in the debate. Roy Martin QC, the Dean of the Faculty of Advocates begin the latest round of counter claims on implementing the Clementi reforms in Scotland, with a story in the Scotsman newspaper today claiming "ACCESS to justice would come under "serious threat" from deregulation of the Scottish legal services market, as proposed by the Which? super complaint to the OFT"
The Dean of the Faculty's claim, is of course, nonsense. The Dean should know all about access to justice of course, as his colleagues in the Faculty and the Law Society of Scotland have been controlling & restricting public access to legal services since time & memorial. Why ? because if you want to get to court, or if you need to use legal services, you have to go through a solicitor or an advocate, and pay them for the services you use. There is no alternative in the current world of legal services in Scotland, and it doesn't take a rocket scientist to understand from that simple explanation that the legal profession will obviously fight any changes to it's monopolistic business model, because that's the way they make their money from you. For example. what if you have a case against the legal profession itself or a case that may impact on legislation the legal profession or judiciary do not want changed ? - chances are you get nowhere, and your injustice will continue for years, or perhaps never be resolved - simply because it's not in the interests of the legal profession to give you access to legal services, or access to justice. 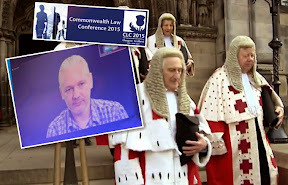 Try getting a lawyer to sue a lawyer - or try making a complaint against a member of the legal profession or judiciary, then you will see just who controls access to Justice, certainly not the public, and far too many politicians, from ALL parties, have stood by for too long, knowing this full well. The legal profession have certainly had some interesting allies in their quest to keep the legal services market for themselves, as I revealed in an earlier article Lord Advocate - Lord Hardie, actually recommended repealing Sections 25-29 of the Law Reform (Misc Provisions) Act 1990, which if implemented at the time, would have broken the lawyers monopoly on legal services and opened up access to justice for everyone in Scotland. Douglas Mill, the infamous Chief Executive of the Law Society of Scotland, couldn't bare to be left out of the publicity war today either, and launched into the Which super complaint issue by claiming "The working group concluded that that overall the evidence backed the case for non-intervention in a market which is balanced by supply and demand. It is disappointing that Which? 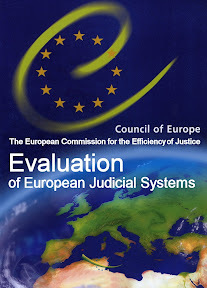 has produced a document which has no evidential base and contains fundamental errors, and which does not contribute in a meaningful way to the debate on such an important topic as the legal services market in Scotland. The society believes that the OFT should take no action on the super complaint." Perhaps it might have been a good idea to ask Douglas Mill, the Law Society of Scotland Chief Executive why he felt solicitors human rights were in breach simply because they were going to lose the right to handle complaints against their own colleagues - the reason Mr Mill publicly threatened the Scottish Executive & Parliament last year with Court action if the LPLA Bill was passed - now there's a real access to justice issue ! 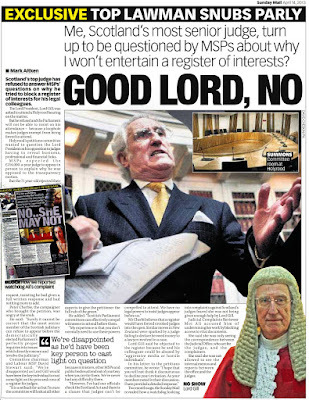 Here's Douglas Mill in an earlier article, ranting on in a somewhat suicidal manner about critics of his beloved membership and stewardship of the Law Society of Scotland for all these years .. bringing in 5000 plus complaints a year against some 9,500 solicitors ... well, hasn't he done well now ! Isn't it a pity it's taking an English based organisation to protect the public's interests in Scotland and open up the debate on access to legal services ? but it does show the power of the Scottish legal profession to keep its monopolistic business market intact and thwart change as much as possible to-date. However, perhaps the intervention by the Which consumer organisation raises the question, where are the SNP led Scottish Executive in this affair ? Why is our own Scottish Government not doing more to open the access to legal services market in Scotland with a full implementation of the Clementi reforms which have been quite successful in England & Wales .. and why has no policy yet been announced on tackling the issues of injustice caused by the legal profession over the years , the SNP, for so long in opposition and now in power at the Executive, knows full well of but stands by watching - as a witness to abuse. Is this a case of the legal profession intervening again with the Scottish Executive and interfering in areas of reforms for the public interest, just to retain their money making capabilities via a monopolistic legal services market ? 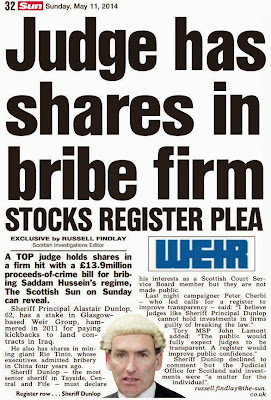 Is it not time to do something good for the public interest regarding the legal services market in Scotland, Mr Salmond ? rather than allow it to be run & maintained by the legal profession itself to make money and control the public's access to justice ? Does Which? know what it is asking? ACCESS to justice would come under "serious threat" from deregulation of the Scottish legal services market, as proposed by the Which? supercomplaint to the OFT, the Faculty of Advocates has warned. Which?, the UK's largest consumer body, wants the OFT to recommend the removal of current restrictions, including those on non-legal ownership of firms and access to advocates, arguing that existing business structures and working practices restrict consumer choice and may be inflating prices. Which? also wants an independent Scottish Legal Services Board to be established, to either oversee regulation of solicitors and advocates, or take regulation out of the hands of the Faculty of Advocates and the Law Society altogether. In its official response the faculty argues that Which? failed to show the legal services market in Scotland is "significantly harming" consumers. Its response warns the consumer body has not grasped that introducing so-called Tesco law would undermine the future of smaller firms throughout Scotland. "Externally owned practices would be likely to be interested principally in the relatively straightforward transaction which can be 'commoditised'," the response states. "They would be unlikely to be interested in intractable or difficult cases, which professional firms currently handle. They would, in particular, be unlikely to be interested in such matters in relatively remote or sparsely populated parts of the country." In an interview with The Scotsman, Roy Martin QC, the dean of the faculty, says the supercomplaint appeared to be trying to transpose English reforms proposed by the Legal Services Bill, possibly out of a desire for a uniform regulatory system across the UK. "The supercomplaint openly promotes the creation of a Scottish Legal Services Board, which as far as can be seen would be identical to the one being created south of the Border with the same regulatory powers and functions," he says. "In essence our position is that it is not appropriate, because of a number of factors, simply to translate the arrangements which are passing through Parliament in Westminster directly into Scotland. It may be said that the purpose of the supercomplaint is no more than to try to create a uniform regulatory regime throughout the UK for no reason other than regulatory consistency. "Given the distinctive characteristics of Scotland and the Scottish legal profession, the desire for regulatory consistency would certainly not be a justification for the changes which they suggest." Martin says that firms of solicitors, and the advocates that they instruct on behalf of their clients, are already providing access to justice "as efficiently as they can", considering Scotland's geography. 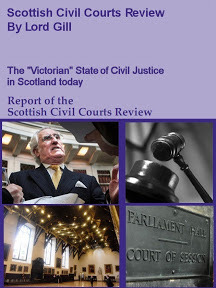 "It is interesting that the supercomplaint almost entirely focuses on transactional type business, such as conveyancing, rather than acknowledging that many of the services provided by the legal profession throughout Scotland are related to a whole range of needs, such as criminal court representation, civil court representation, family disputes, and custody of children," he says. "The fact that these things are done differently in Scotland and in the interests of justice ought to be done differently is a reason why we should not simply copy the regulatory arrangements which may be found to be appropriate in England and Wales." The Faculty has also questioned whether the supercomplaint - made under the terms of the Enterprise Act 2002 - should be calling for changes to regulation that would require primary legislation to be passed by the Scottish Parliament. Its response also suggests that any action made by the OFT as a result of the supercomplaint "may not be lawful", as Which? has not fulfilled the requirements set out by section 11 of the act. Martin adds that changes to the working practices of advocates would need to be considered by the Lord President, who has a role in regulating the public office of advocates. In its response to the supercomplaint, the Law Society has also called for no action to be taken by the OFT. However, its position is complicated by the fact that some larger firms support the introduction of alternative business structures - if only to ensure they can have a level playing field with their English counterparts. "The society is keenly aware that there are a number of interests which must be carefully balanced, including access to justice, competition in the legal services market and consumer protection," says the Law Society's chief executive, Douglas Mill. "There are a number of different proposals and business models currently under discussion, and the society is actively raising the debate to ensure that whatever changes are made to legislation, these competing interests are taken into account. The society is consulting with the solicitors' profession to gain their views of the Bill before the Westminster Parliament which will apply to England and Wales. It held a successful conference in London with its members based there to spark the debate and gain important feedback." A major conference on alternative business structures is planned in Edinburgh on 28 September, and the society says it is also keen to see work by the Executive to build on the findings of last year's Research Working Group report, which recommended there should be no intervention in the market. Mill adds: "The working group concluded that that overall the evidence backed the case for non-intervention in a market which is balanced by supply and demand. It is disappointing that Which? has produced a document which has no evidential base and contains fundamental errors, and which does not contribute in a meaningful way to the debate on such an important topic as the legal services market in Scotland. The society believes that the OFT should take no action on the supercomplaint." If the OFT does decide to take action, however, then the society has called for research to be commissioned, to identify how the legal services market operates in Scotland, bearing in mind "the impact upon consumers" of the proposals set out in the super-complaint. A spokesman for the OFT says it is required to respond to the supercomplaint from Which? by 31 July, but he adds that he is unable to comment further. Labels: access to legal services, Douglas Mill, OFT, Which? Does Scotland require a Human Rights Commission ? Certainly Yes. There is currently no one organisation for anyone to go to in the event of a breach of Human Rights or a failure to comply with ECHR. Yes, of course, one can go to a solicitor - but what happens if the legal profession don't want to take the case ? That means you have no access to justice therefore no avenue to redress the issues of Human Rights and since there is currently no other service on offer to look into or represent those whose Human Rights have been breached, that's it. If a Human Rights Commissioner is to be put in place by the Scottish Parliament, it should be an effective independent, and even accountable regulator for people to turn to when Human Rights issues are breached or are up for debate. A good example of a somewhat failed attempt at an Ombudsman service, has been the Scottish Legal Services Ombudsman, whose office was created in the Law Reform (Misc Provisions) Act 1990. Only allowed to make reports on cases where a complainer had exhausted the very corrupt complaints process of the Law Society of Scotland, the office of the SLSO could only make non-binding recommendations on complaints brought to it's attention, had limited powers of publishing it's findings against lawyers in the media (which were hardly ever used) and most people who went to the Ombudsman's office usually got the feeling it was an attempt at being an apologist for the legal profession's lack of proper regulation .. which is in fact what it was. Here follows an example of a complaint report from the Scottish Legal Services Ombudsman on one of my own complaints against a solicitor, Mr David Reid, formerly of Morisons Solicitors & Messrs Campbell Smith WS, both of Edinburgh. The lawyer, who once I thought of as a wise & reliable solicitor, Mr Reid took a sickie when I discovered he had been a lot less than honest in dealings on my legal work, and is now unbelievably a Law Accountant adjusting bills for client service. So we are back to the issue of a Human Rights Commissioner for Scotland - which will be as much use as no use if the office is only allowed to follow along the lines of the much vaunted Police Complaints Commission for Scotland, which has already come out in the press and called for stronger powers since effectively, they have none. Yes, we do need a Human Rights Commissioner, independent, accountable, and with effective strong powers and the will to use them. We don't need another limited powers Ombudsman just to prolong the long held culture of injustice in Scotland which too many organisations and public bodies have become used to. MSPs last night demanded that Holyrood abandon moves to appoint a £75,000-a-year human rights "tsar". The calls came after advertisements were published for a full-time chairman of the Scottish Human Rights Commission, who will head a panel of four part-time members and have an annual budget of £1 million. Opposition MSPs said that the creation of the body - which will be charged with promoting human rights - was a waste of taxpayers' money. Derek Brownlee, the Tory spokesman on finance, said: "This will be a glorified talking shop and a complete and utter waste of money." Mr Brownlee called on the Scottish Executive to abolish the commission. In the words of Alistair Sim, Director of Marsh UK - there isn't a lawyer in Scotland who doesn't have a complaints record. Well, with 5000 plus complaints a year, for the last 10 years, coming in against around 9,500 solicitors in Scotland, that would mean that either every lawyer has had around 5 complaints made against them by clients, or some lawyers have many more complaints made against them by clients, which the Law Society dutifully prevaricates, delays, fiddles, fobs off, etc to make sure the very cream of the crooked in Scotland's legal profession get off the hook every time while the client gets ruined. So, with the pool of lawyers in Scotland being tainted in the blood of clients, the legal profession needs to look to other areas of the population to expand it's services, which is why we are currently being treated to a raft of stories on the recruitment of paralegals and the lowering of 'education requirements' of those joining the legal profession. Something perhaps along the lines of ... "you don't need all that education just now, we can train you up to be a good litte crook later on!" The thing about paralegals, is they are of course, regulated by the Law Society of Scotland - so when your shiny new paralegal does as much damage to your case as your crooked solicitor might have done, there will be as much redress against their actions as we currently have with crooked lawyers - and that is none .. at least none until the new Scottish Legal Complaints Commission comes along, if it survives the pasting the Law Society and the legal profession are currently giving it .. fiddling in it's appointments plans, having a few meetings on the side with politicians to 'limit' it's remit among other things. The question too on paralegals of course, is, would you like to work for a well known, allegedly respectable firm of lawyers which has nailed clients to the wall on so many occasions previously ? What good would it do someone to go work for a firm of lawyers, were for instance, a senior partner has paid for an assault to be carried out on a client ? or an Office Manger has assaulted one of the female members of staff & got away with it ? How much trust could someone put in a firm like that and what advantages could it bring paralegals who work for such a firm ? 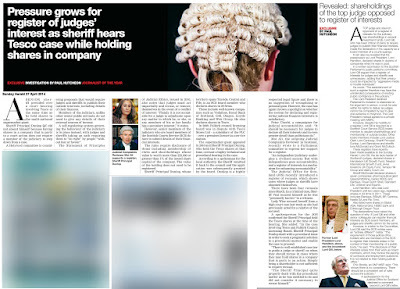 Here follows, is a story from the Scotsman on paralegals and how the legal profession now embrace them, hoping for their salvation in non lawyers, when salvation is perhaps putting right the sins of the past and learning to treat clients with respect, as the law demands. IF THERE is one thing all Scottish law firms welcome, it is the emergence of the paralegal profession. It provides a fulfilling career for many highly motivated people, and the qualification has earned the respect of the entire industry. However, many firms are split on how to recruit and train paralegals. Should you recruit people with some previous legal training or train from scratch? Caesar & Howie prefer the latter route. First we look for people with the right attitude and abilities in customer service. Our firm's overriding priority is to ensure clients experience a personal and professional quality of service. We have therefore focused our recruitment efforts for paralegals towards people who can demonstrate excellent customer-service skills, then we train them to be paralegals. We are fortunate to have a former law lecturer from Stirling University as part of our in-house training department who assesses the candidates and puts them through their training. This is supplemented by specialist paralegal training materials, purchased from Strathclyde University, as well as home study assignments. I believe that knowledge can be taught but attitudes and personality cannot. The technical skills can be acquired, but it is difficult to find good customer service via a textbook. We recently recruited six conveynancing paralegals, none of whom had a legal background. Without exception they have excelled in the paralegal positions. They have completed their paralegal exams in just three months - the shortest time ever recorded in the firm - and with a further 6-12 months' practical experience will become fully qualified. All the candidates had responded to an advertisement in a local newspaper. One of the respondents was Wilma Hunter, a local government officer. She had always been keen on the law but had been put off by the competitive nature of the legal profession and the demanding entry qualifications. Wilma never thought she could gain a legal qualification, but now she is confidently dealing with our clients on their conveyancing transactions. The key attributes we look for in paralegals are good communications, organisational and customer service skills as well as a great deal of common sense. Coupled with a willingness to learn, there is no reason why anyone from a wide range of backgrounds cannot have a satisfying career as a paralegal. • David Borrowman is the managing partner of Caesar & Howie, the central Scotland law group. It only takes a few minutes in reality for the cries of "rising standards" within the Scottish legal profession to be proved wrong. 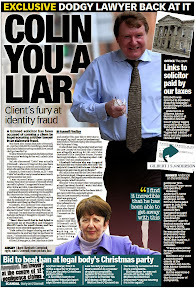 The following case reported in the Scotsman newspaper of a lawyer admitting to giving a client a false alibi (wasting one's career on a client, a dangerous thing indeed) will give the Scottish Solicitors Discipline Tribunal something more to shout about , or perhaps a victim to take their public rage out on, proving the world still needs their failed remit. 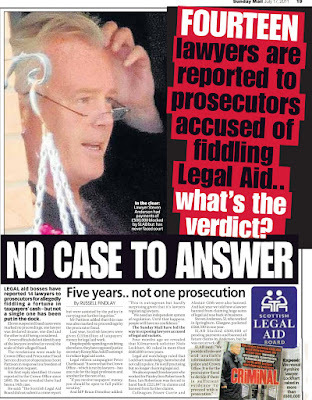 It has been pointed out that if the accused resigns his position on the Solicitors Roll, like Ms Angela Baillie who reputedly caused the SSDT such grief last week as to provoke a run to the newspapers in search of new powers, he could regain his practicing certificate later on but maybe Paul McBride his defence Counsel has already pointed that one out, being the same defence Counsel of Ms Baillie. Of course, lawyers regularly give alibis to other lawyers when it involves a client complaint, on everything from defrauding banks & faking up files, to even defrauding clients & the inland revenue. It's just this time, the lawyer has admitted in court, giving an alibi to a client. Usually, there isn't even an eyebrow raised to the former, but the latter it seems is a taboo in the legal profession, not to mention against the law in both cases of course. The spectacle of the SSDT calling for new laws after the event is reminiscent of the Law Society making a big fuss over the powers given to it in the Council of the Law Society of Scotland Bill, ran through the Scottish Parliament at great speed by former Tory leader David 'Taxi' McLetchie MSP & Roseanna Cunningham MSP, former chair of the Justice & Home Affairs Committee of the Scottish Parliament. 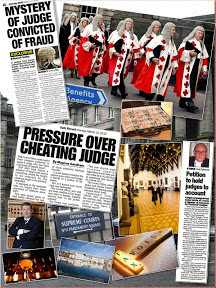 The Council of the Law Society of Scotland Act 2003 was yet another piece of legal profession sponsored legislation which was claimed would clean up the regulatory world of lawyer covering up for lawyer .. although as we all know, has had no impact on the ever rising levels of corruption in the Scottish legal profession, only proving yet again the failure of allowing lawyers to regulate themselves. 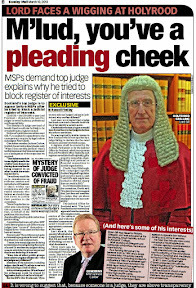 One has to wonder why the accused solicitor has even had to admit guilt .. as there are a fair few in the legal profession with criminal convictions still practicing and some who have faced much more serious allegations than the solicitor in the story... it's just the Law Society of Scotland won't let the public know about it. At the High Court in Glasgow, Pervez, of Crookston, Glasgow, admitted attempting to pervert the course of justice. The judge, Lord Hardie, told Pervez he faced jail, but he continued his bail pending sentence next month, ordering him to report to the police twice daily. The judge was told that Pervez was now no longer practising as a solicitor and would eventually be struck off. Alex Prentice, prosecuting, said Pervez was a conveyancing lawyer at Belton Pervez in Victoria Road, Glasgow, when the offence happened between 22 March and 23 May, 2005. Mr Prentice said the lawyer was approached by one of his clients who was indicted for a High Court trial alleging charges of abduction, assault and attempted extortion. He asked the solicitor to provide him with an alibi and Pervez agreed. A special defence of alibi was lodged for the trial, and the Crown instructed police to take statements from Pervez. He told them the man was in his office discussing an insurance claim between 11:30am and noon, when it was alleged the crime was committed. He repeated this in a sworn affidavit. Mr Prentice told the court concerns were raised that the alibi might have been concocted and police were instructed by the Crown to investigate. Paul McBride, QC, defending, told Lord Hardie: "He is a naive, stupid young man who has succumbed to threats of violence from people involved in serious, monumental criminality." 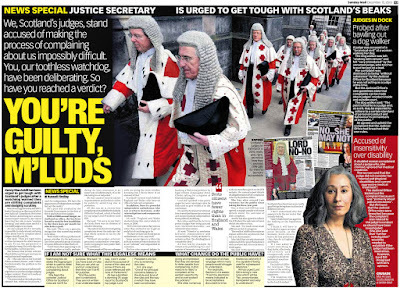 If there was a requirement that all members of juries had to be lawyers, judges, policemen, or their colleagues, appointed by the head of Scotland's Judiciary, would anyone think a fair trial could take place ? 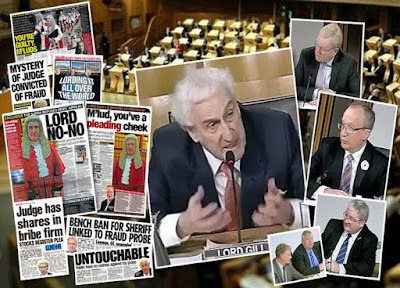 How long, for instance, would it take the likes of Donald Findlay QC to point out one of his clients might not get a fair hearing because the jury was composed of Police Officers ? ... 5 minutes ? However, this is considered the norm at the Scottish Solicitors Discipline Tribunal, when dealing with complaints & prosecutions against solicitors and there are no cries of lack of impartiality and no claims of lack of a fair hearing from the legal profession itself .. because lawyers prefer to be judged by their own, so they escape punishment of course. This has been the way complaints procedures have been rigged handled by the legal profession for decades. "The Scottish Solicitors’ Discipline Tribunal (SSDT) is an independent body which mainly deals with serious disciplinary issues that arise from time to time within the Scottish legal profession." 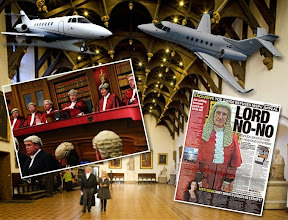 It then goes on to admit that "The Tribunal is governed by a set of rules (Scottish Solicitors Discipline Tribunal Procedure Rules 2005) which must be approved by the the Lord President of the Court of Session. " 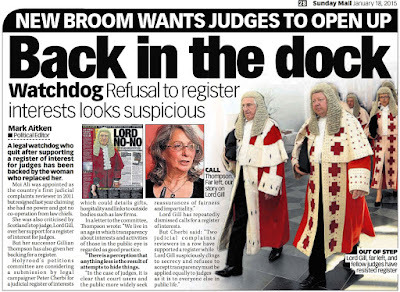 Independent, but organised & approved by the Lord President ... a member of the judiciary, a lawyer, member of the Law Society of Scotland ... how's that for independence ? 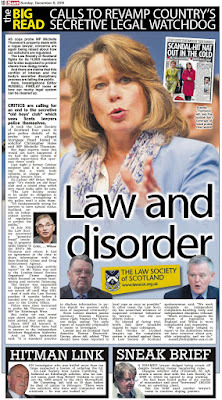 In another bash at putting forward the impression of independence, the SSDT goes on to say "The Tribunal normally sits with 3 solicitor members and 2 lay members: solicitor members cannot also be members of the Council of the Law Society (governing body in Scotland); lay members are drawn from all backgrounds and walks of life. 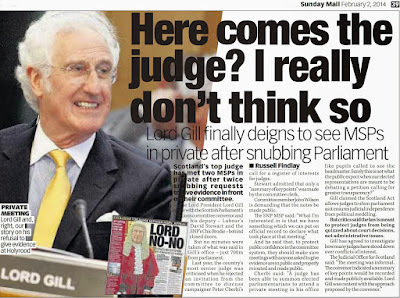 All members are appointed by the Lord President of the Court of Session – Scotland’s most senior judge." Pretty thick stuff from the SSDT to give the public the impression they are independent, but reading of their endeavors over the years, or having experience of the complaints process of the legal profession might lead one to think the Scottish legal profession learned their trade on how to write rules for themselves from the Enabling Act of 1933 in Germany written by the Nazis. "lay members are drawn from all backgrounds & walks of life" .. and " are appointed by the Lord President of the Court of Session" ... almost makes one squirm, doesn't it ? If you want to be a "lay member" in anything to do with self regulation, be it the SSDT, the Law Society of Scotland, ICAS, or any of the other rather infamously corrupt self regulators of the professions, it looks like you have to sit on a few other self regulatory, self pat on the back committees too ... in essence, no brickies or plumbers allowed. Well, that experience has produced cases such as this : Tribunal ‘had no power’ over lawyer who dealt in drugs showing a rather uneven call for increased powers when other more powerful cases before the SSDT in the past have had little attention. or this : Council of the Law Society of Scotland v Gordon & Maria Thomson - in the case where the legal profession set up Gordon Thomson on false charges so they could take his business away from him (one of the legal firms I was using at the time a willing participant - Alex Morison & Co who 'cornered Mr Thomson's business on instructions from the Law Society) The powers of the SSDT were viciously used against Mr Thomson in that case - used as a lethal weapon against one of it's own who dissented from the line from Law Society HQ in Drumsheugh Gardens. or this : Lawyer slammed for lying to client - reporting on an item from one of my cases, where even to this day, the lawyer concerned is still battling with the SSDT over the verdict against him, which Robson successfully challenged .. and the SSDT sit back and do nothing of course, because it ultimately involves myself. Easy to conclude then from the above, that the Scottish Solicitors Discipline Tribunal need replacing with something much more independent, accountable and transparent - because the SSDT of the past and present is nothing of these things. What of the SSDT when the new Scottish Legal Complaints Commission comes along ? 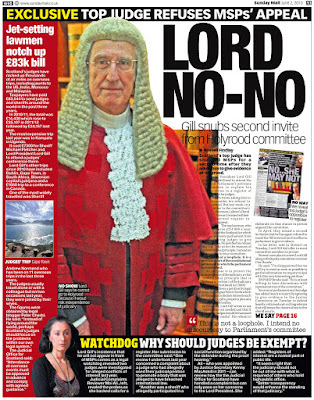 Well, it will still exist, much as it currently is, biased, prejudiced, and lacking any accountability, transparency or honesty, unless further reforms come forth from the seemingly unwilling halls of the Scottish Executive Justice Department to do much on the injustice front so far. Oh yes, I know it's early days of the new Executive .. we keep getting told that .. it's early days ... early days .. will they be saying that in 3 years time ? after a few more threatening 'open letters' from ex judges in the newspapers to the Justice Minister ? Should the public become more vocal or active in pressing home their cases of injustice and calling for & gaining reforms to the legal system ? Yes, I think we should.. 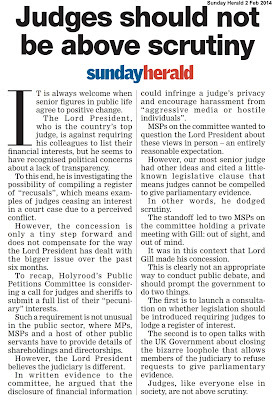 Following story from the Herald newspaper on the SSDT calling for more powers, when it should really be abolished and replaced by something not concocted by the legal profession itself. A solicitors' watchdog has called for a change in the law after it was unable to impose an effective punishment on a lawyer jailed for drug dealing. Angela Baillie was sentenced to 32 months for smuggling heroin and valium into Barlinnie Prison in Glasgow. 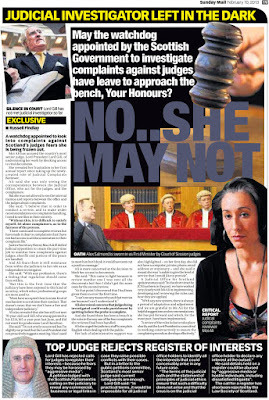 By the time the Law Society referred her case to the Scottish Solicitors' Discipline Tribunal, Baillie had applied successfully to have her name removed from the roll of solicitors. The tribunal is concerned that it could only censure the former lawyer instead of the maximum penalty of striking her from the register and has called for a change. It wants a member with proceedings pending to be unable to remove their name so that it can take action. Baillie, of Birnam Place, Glasgow, was jailed in April last year for delivering a cigarette packet stuffed with heroin and valium worth almost £1600 to a man in Barlinnie. The case came before the tribunal in December but her name had been removed from the roll two days after she was convicted. In a written ruling yesterday, the tribunal expressed concern about lacking the power to impose an appropriate punishment. 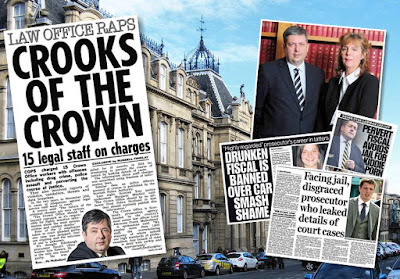 It said: "The offences to which Baillie pled guilty before the High Court strike at the very heart of the obligations of honesty and integrity which are incumbent on every solicitor. "It is difficult to imagine conduct more calculated to damage the profession in the eyes of the public." It stated it was "wholly unsatisfactory" that the tribunal could not show the public and other lawyers the "odium" they felt about Baillie's conduct. The judgment stated: "The tribunal wishes to place on record its concern that it lacks the power to impose upon the respondent a penalty which it would regard as appropriate in the circumstances of this case, but is placed in the position of doing no more than impose an inadequate and ineffective penalty." 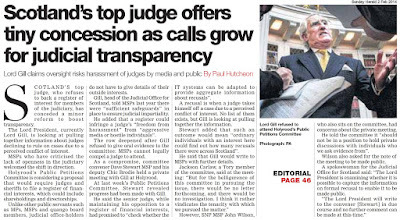 The tribunal called on the Law Society to take urgent steps to change the rules on such matters. Once a name has been removed from the roll, the tribunal is only able to issue a censure or a fine. However if the person has been sentenced to more than two years in prison it is unable to impose a financial penalty, and as Baillie was jailed for 32 months the only option remaining to the frustrated tribunal was censure. One possibility recommended is that a solicitor should not be allowed to remove their name from the roll when disciplinary action is possible. At the trial, Judge Lord Kinclaven told Baillie: "Your case, like many others in this court, clearly illustrates the damage and devastation that can be caused by involvement with drugs and the drug trade." "The quantities of the drugs made it plain they were not for personal use. They were for supply in the prison system generally." He added: "You were in a position of trust." Baillie had used the lawyers' consulting room at Barlinnie for the hand-over on October 23, 2005. The prisoner she met, who cannot be identified for legal reasons, was strip-searched as he left the meeting and the cigarette packet was found. 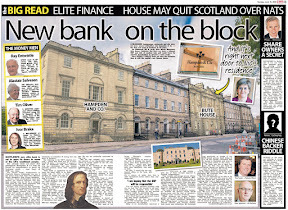 Read on for an interesting article from "The Herald" Newspaper, where a solicitor who was struck off by the Law Society of Scotland has had the decision quashed by the Court of Session. 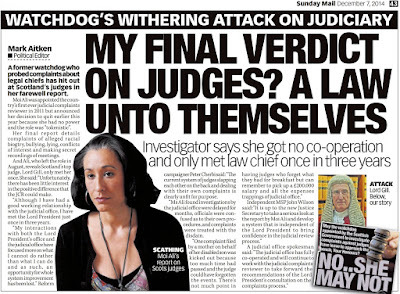 This is a complicated case, and one quite different from a previous case which saw a stitch up of a famous Edinburgh Solicitor - Gordon Thomson & his wife's legal practice, which was becoming too successful for other members of the legal profession. The Court of Session has quashed a decision by the Scottish Solicitors Disciplinary Tribunal to strike off Michael Robson, a principled solicitor who challenged the legal establishment and took on a slate of victims of legal injustice – only to find himself overwhelmed by the demands on his one-man practice. 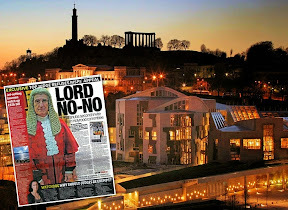 The opinion of Lords Kirkwood, Maclean and Osborne, that the tribunal's sentence was "excessive", will be noted by those observers of the profess-ion who claim that solicitors seen as "troublesome" by the Law Society of Scotland are unlikely to prosper. Robson, 52, was a successful lawyer who set up on his own in 1998, and quickly became a "last resort" for clients whose complaints against solicitors had been turned away by other practices, and rejected by the Law Society of Scotland. In 1999, he publicly challenged the Law Society's master insurance policy, now under investigation by the Office of Fair Trading, and criticised its complaints procedure. Robson said the Law Society had "set up an insurance system which protects solicitors at the expense of their clients", while its complaints procedure was "the profession judging its members". Petitioning the Court of Session for a judicial review of one case involving misconduct by lawyers, Robson said then that the review "strikes at the fundamentals of the legal profession". Less than three years later, his practice was closed down, and Robson struck off and sequestrated, following zealous policing of his business by the Law Society on behalf of demanding clients, some of whose cases the society itself had dismissed. 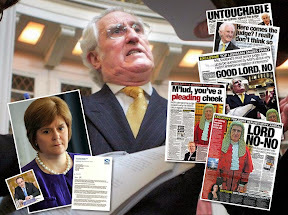 Robson had been a solicitor for 25 years with an exemplary record when he was reported in 2001 by the Law Society of Scotland to the Scottish Solicitors Disciplinary Tribunal for failing to answer letters. In January 2002 the tribunal fined him £5000 for profess-ional misconduct and said he could no longer practice alone. The tribunal, a body with legal and lay members, ruled that Robson could work for another firm – but only with the approval of the Law Society. Although two firms immediately offered him an unsolicited position, the Law Society refused to approve his appointment, pushing the father of four into a financial crisis, on top of mounting health problems. 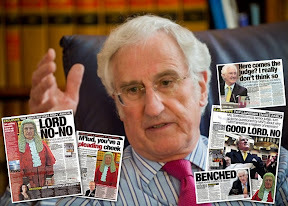 In June 2002 the Law Society reported him a second time to the tribunal, citing his failure to answer further letters dating from the previous year – though by this time Robson had already been forced to shut the firm and make his three staff redundant. Robson pleaded for an 11th-hour adjournment, as on the day he was unable to attend and plead mitigation, but the tribunal refused. The hearing went ahead on October 8, 2002 and Robson was struck off. The following day, he was sequestrated. He was subsequently diagnosed with a sleeping disorder. In their judgment, their Lordships state: "We have taken into account the fact that there had been no complaint of profess-ional misconduct when the petitioner had been a partner in two law firms, and that neither of the complaints which had been made involved any element of dishonesty. 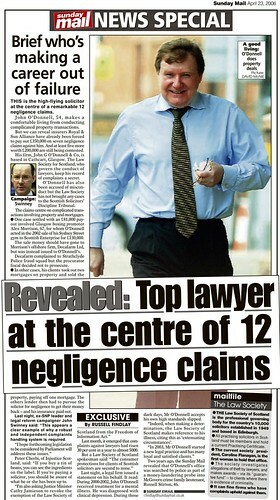 The professional misconduct of which he was found guilty was undoubtedly serious, but we also have to consider the financial position in which the petitioner found himself as a result of not being able to be employed as a solicitor under supervision after March 2002 because (the Law Society) would not approve the firm which had been prepared to employ him." The decision to strike Robson off had been excessive, "particularly having regard to the financial consequences of (the Law Society's) decision in May 2002 to defer considerat-ion of the application to employ the petitioner as an assistant". 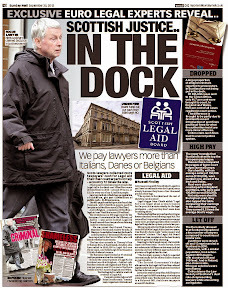 Robson commented: "These (clients) were people whom the Law Society had failed to look after. Then they put the boot in, when you are trying to deal with a very complex situation. It is a bit rich. They dredged up everything under the sun, for instance they persuaded one person to make a complaint of misconduct against me. 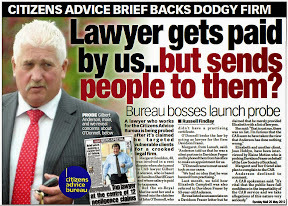 I had been a solicitor for 25 years and had avoided complaints like the plague." 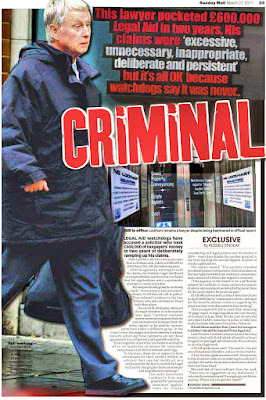 In 2001 Robson took on a case brought by two bankrupted developers against the Clydesdale Bank. As an investigation by The Herald revealed, Graeme Duffy and Richard Crocket were only sequestrated as a result of the disastrous employment by the bank of Euan Wallace, a well-known Glasgow surveyor who was shortly to be struck off for life for serious professional misconduct. Three years later, there is independent evidence that Duffy and Crocket's property assets in March 2000 comfortably outweighed the sum for which they were sequestrated by the bank, which therefore acted wrongly. The developers had at the time just launched a £3m damages action against the Clydesdale over Wallace's conduct. 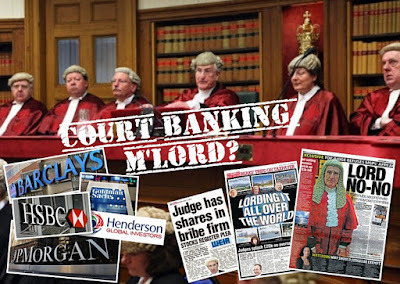 But since the demise of Robsons WS, no law firm has been prepared to take their case to the House of Lords, though Robson subsequently reported the bank and its solicitors for prosecution on the grounds that a false claim for bankruptcy had been lodged. Such daunting cases, however, took their toll on Robsons WS, and on the health of its founder, who now works as a part-time tennis coach. The judges quashed the decision to strike him off, and have substituted a five-year restriction which allows him to work for "such employer as may be approved by the Council of the Law Society of Scotland". The petition to the Court of Session also argued that the tribunal was "not independent and impartial within the meaning of Article 6(1) of the European Convention of Human Rights", partly because the Law Society both brought complaints to the tribunal and appointed its members. 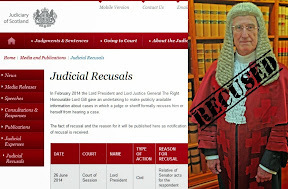 The petition noted that "the Lord President did not have power to appoint any solicitor member who had not first been recommended" (by the society), and suggested that a tribunal member's "prospects of reappointment would be improved" if he consistently upheld complaints. 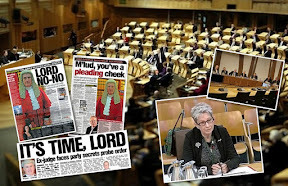 It further pointed to the Law Society's own submission to the Scottish Parliament in June 2002 which suggested that the Judicial Appointments Board might nominate tribunal members. The Law Society's response to the court was that this was simply one of a number of "suggestions as to how the tribunal could be improved". The judges concluded that because "solicitor members must be knowledgeable and experienced and the actual appointments are made by the Lord President", the appointment procedure did not detract from the independence and impartiality of the tribunal. 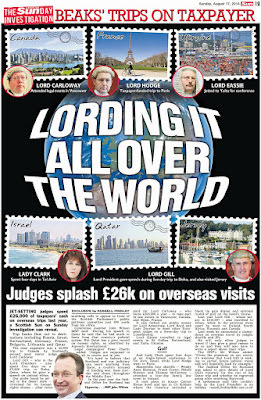 Their lordships dismissed all other objections to the procedure. Their decision to amend the sentence on Robson was, moreover, reached "with some hesitation". In an immediate response to the ruling, the Law Society played down the judges' ruling that Robson should not have been struck off. Reporting on the case, its in-house journal gave priority instead to the fact that the Scottish Solicitors' Discipline Tribunal was found to satisfy the "independent and impartial tribunal" requirement of the European Convention.